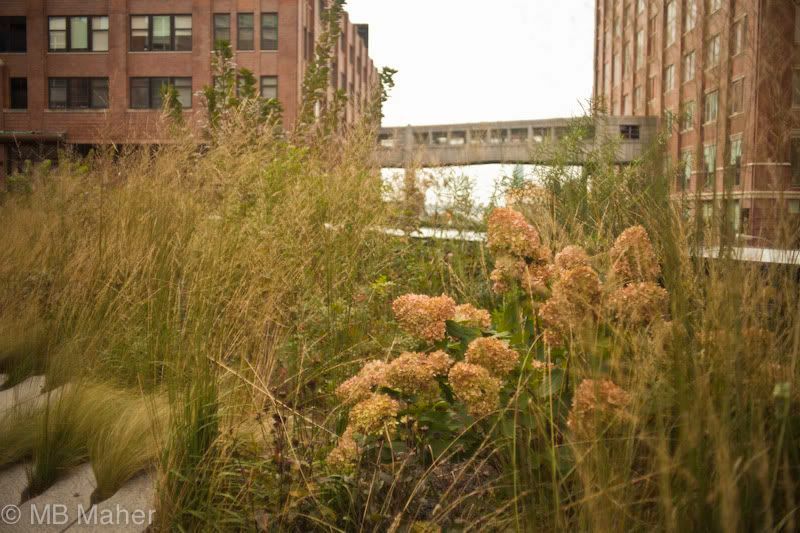 I first became intrigued by the High Line when it was in its derelict state. I’d read a New York Times piece about an abandoned elevated railway in Manhattan, its purpose as a rail line to the meatpacking warehouses long forgotten by the citizens who walked oblivious beneath its struts and girders. That the trestled railway had been designed to run directly into the maws of cavernous warehouses, relieving the city streets of the congestion and danger of rail traffic, only added to its allure. Of course, one of America’s greatest cities would invent such an elegant solution! Closed down since 1980 as highway trucking replaced rail, accessible now only to the birds and the wind, soil and grit sifted down amongst the tracks to support an improbable habitat for native plants and nesting grounds for agile urban creatures of all legs except the two-legged. When my oldest son first visited New York, I encouraged him to trespass, hop fences, whatever it took to visit the abandoned railway and bring back photos, which no doubt makes me a very bad mother blessed with a very good (and agile) son, because he complied. I kept up with news that the railway was being considered for preservation and that a park was contemplated but lost track of the story. 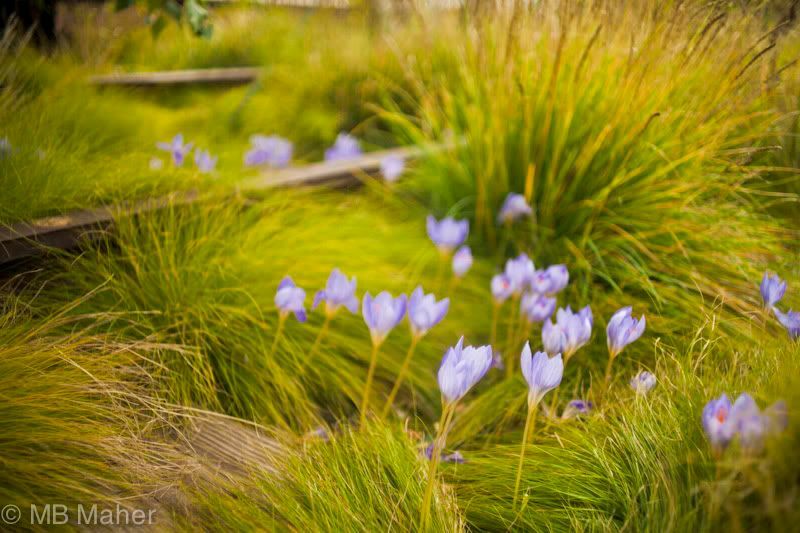 And then sometime last year I was presented with the challenge of absorbing the astonishing fact that not only was the High Line saved, but the park was being planted by Piet Oudolf. In recent memory, when has something as thrillingly, ecstatically wonderful happened in furtherance of the creation of a public space? 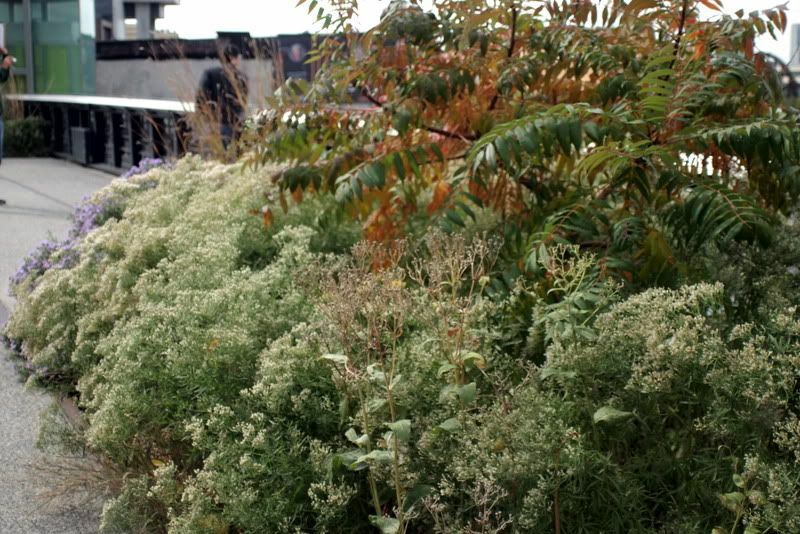 Yes, there’s the Lurie Garden in Chicago, also planted by Oudolf, but the High Line’s hulking, atrophied purpose had seized my imagination from clear across the country. Whether Jane Jacobs, whose medal was recently bestowed on the High Line’s planners, would be pleased with the mega-bucks project is open to discussion. (Every city should be fortunate enough to have such heated discussions about parks.) She famously loathed big-concept “projects.” And the High Line sidesteps a couple of Jacobs’ requirements for “intensely used” parks: intricacy, centering, sun, and enclosure. (From Jacobs’ chapter “The Uses of Neighborhood Parks,” The Death and Life of Great American Cities.) True, the High Line is not completely finished, so it may be too early to pass judgment, but it seems unlikely it will fulfill Jacobs’ requirement of centering, since by its very nature as a former railway it is inescapably linear. In the same chapter, Jacobs describes traversing linear, riverside parks as a “trudge on a treadmill,” but walking the High Line is anything but a trudge. For such an exposed site, park goers are paradoxically enfolded and protected by the surrounding skyline of Manhattan, providing Jacobs’ sense of enclosure. During our visit to the High Line, crowds of school kids used it as a shortcut around congested city streets, and there were at least two commercial photo shoots taking place amidst the throngs of visitors. Moms with coffee in hand pushed strollers. 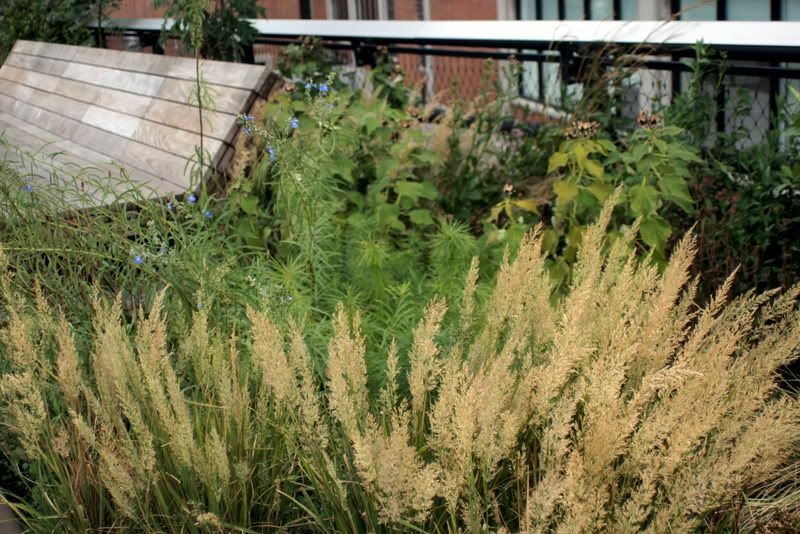 If intricacy is related to “the variety of reasons for which people come to neighborhood parks,” the High Line has intricacy covered. 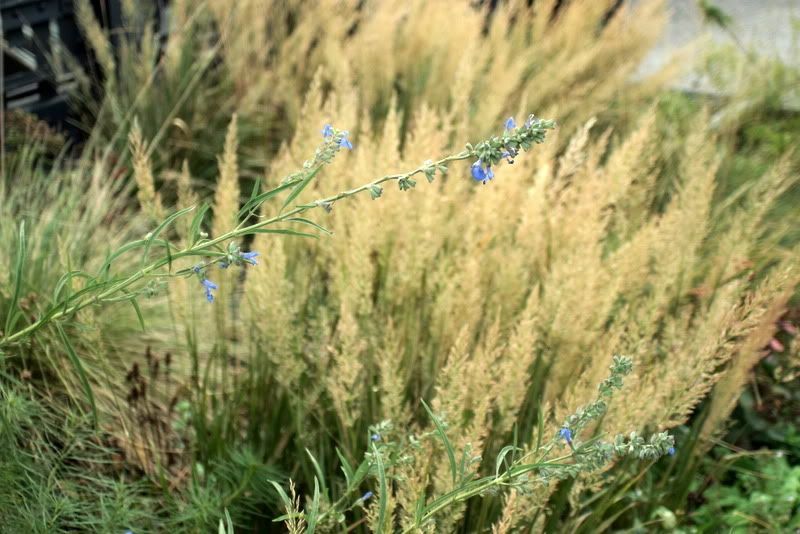 Although the park sprang from Chelsea neighborhood activism, it is not an intimate neighborhood park but an entirely new construct, and it took an amazing leap of imagination, New York-sized, to bring it into existence. Catching sight of the Empire State Building from its lush, prairie-planted walkways brought about a surprising upwelling of a mixture of pride and awe that I haven’t felt in a while. This was my first visit to NYC, other than passing through its airport on the way to Europe. Coincidentally, on the airplane I was reading “The Great Gatsby,” reminded to finally read this slim novel by the current 7-hour production of it called “Gatz,” staged by the Elevator Repair Service. The plantings were sumptuous. 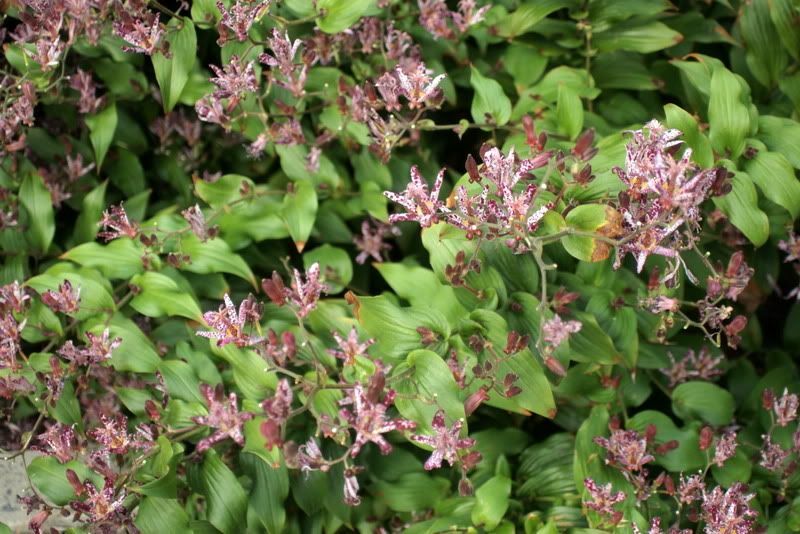 I saw plants for the first time that I’d only read about, like tricyrtis, the toad lily, planted in shrub-sized swathes. 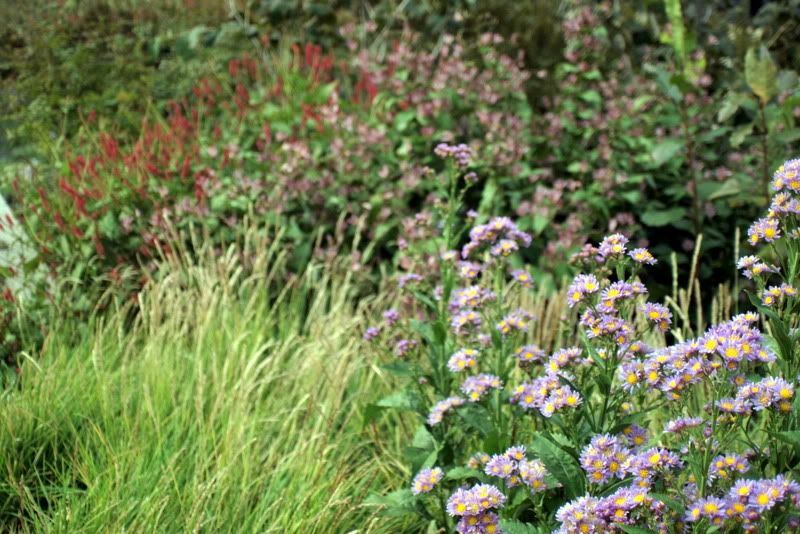 Persicaria ‘Firetail,’ distant left, is familiar to me and performs well in Southern California. 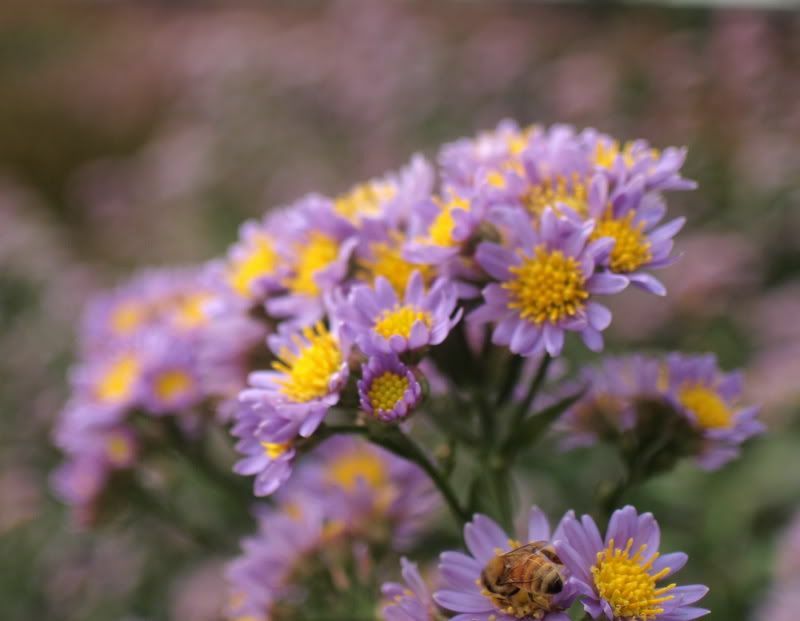 Fall-blooming plants like Symphyotricum (nee aster) will also technically grow in zone 10 but are a bit beside the point here, taking up far too much space the rest of the year when not in bloom, and seem best suited for climates where gardens are laid to rest for a long winter. 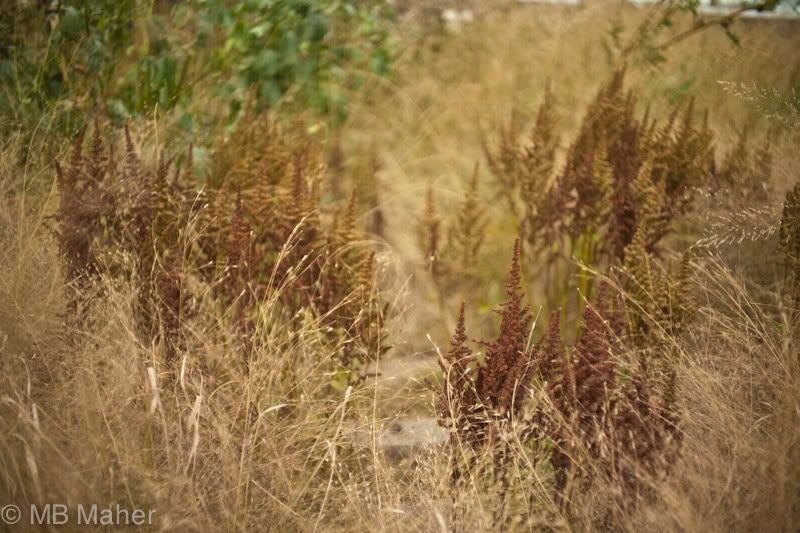 There was much to learn from the incredible mix of trees and shrubs even in late fall, the careful attention to scale and mass, the windswept movement of the grasses, seen here with the dessicated, coffee-colored plumes of astilbe. 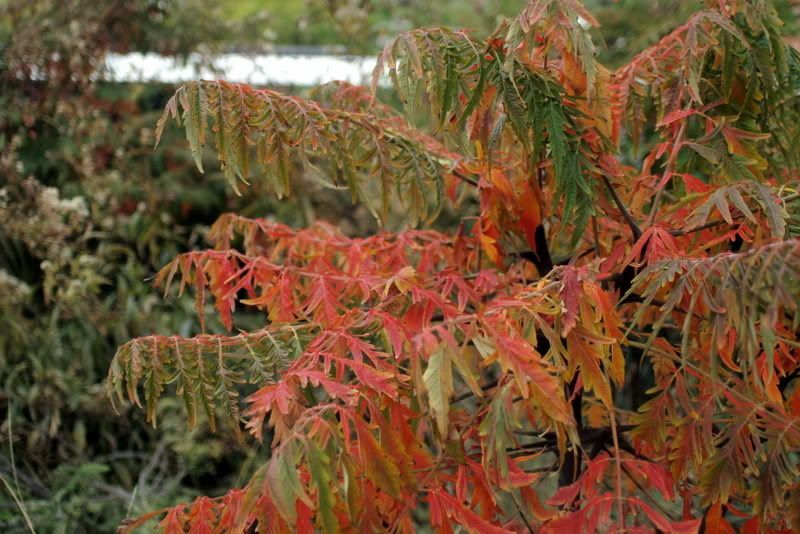 Cut-leaf sumac? 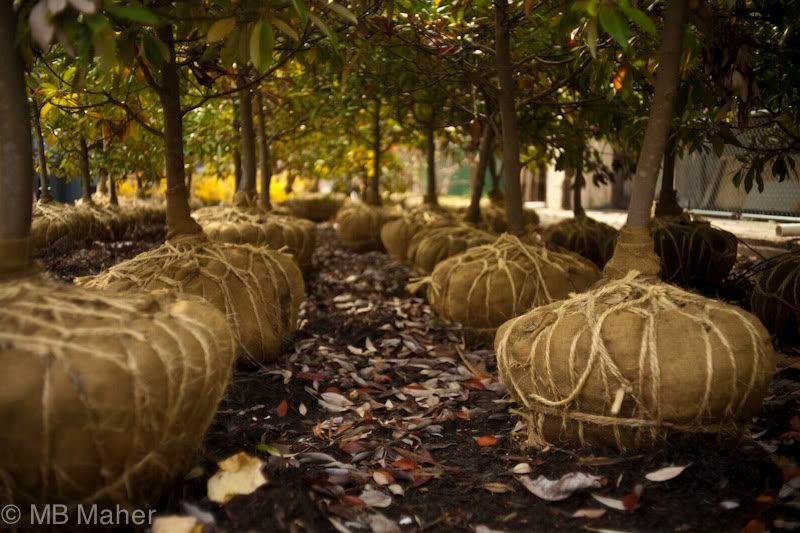 If there were plant labels, they’d been submerged under luxuriant summer growth now tinged in fall color. 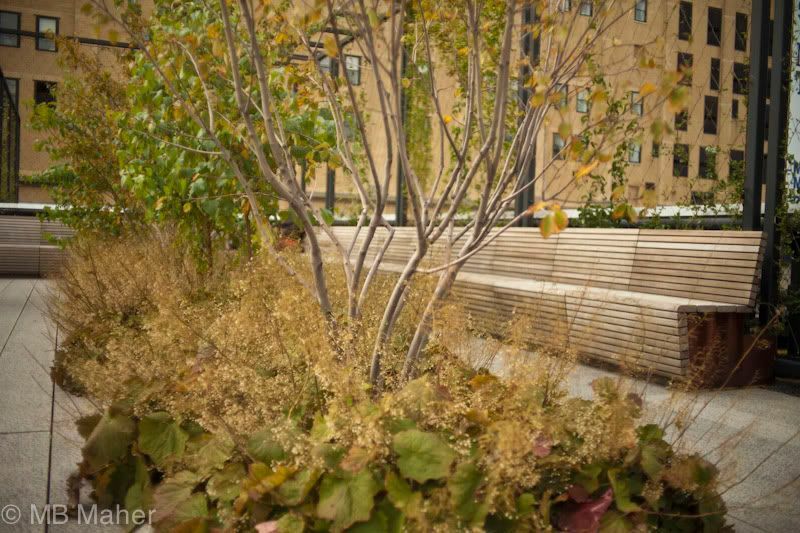 Under the High Line at Gansevoort Street, nursery stock is temporarily staged, but this space may ultimately be absorbed by the proposed Whitney expansion. A temporary art installation over the plant staging area distills the world in text to its basic elements. 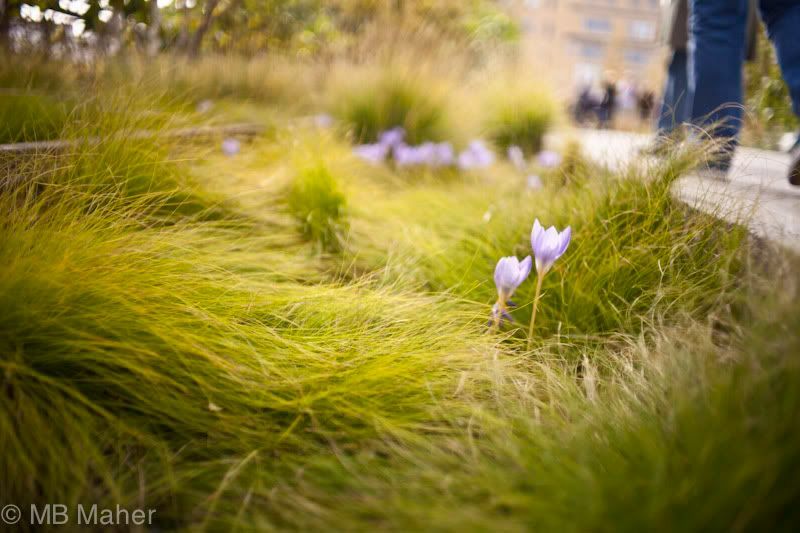 Here’s another recent post on the High Line in autumn from Victoria’s Backyard. 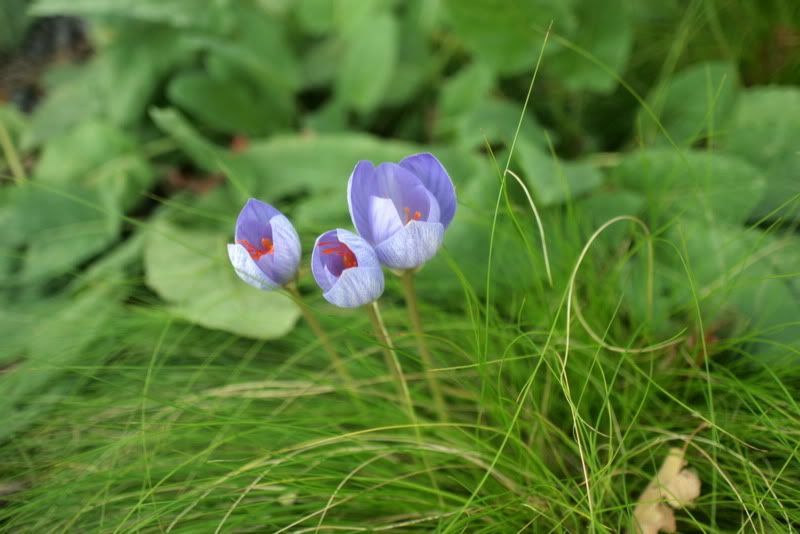 This entry was posted in garden visit, MB Maher and tagged Crocus sativus, Jane Jacobs, Piet Oudolf, The Great Gatsby, The High Line Park. Bookmark the permalink. How wonderful Denise-thanks to you and the first rate MB for the wonderful photos and historical perspective.Maybe this will be tucked into next summers east coast visit..NY is pretty dinky compared to our state ! 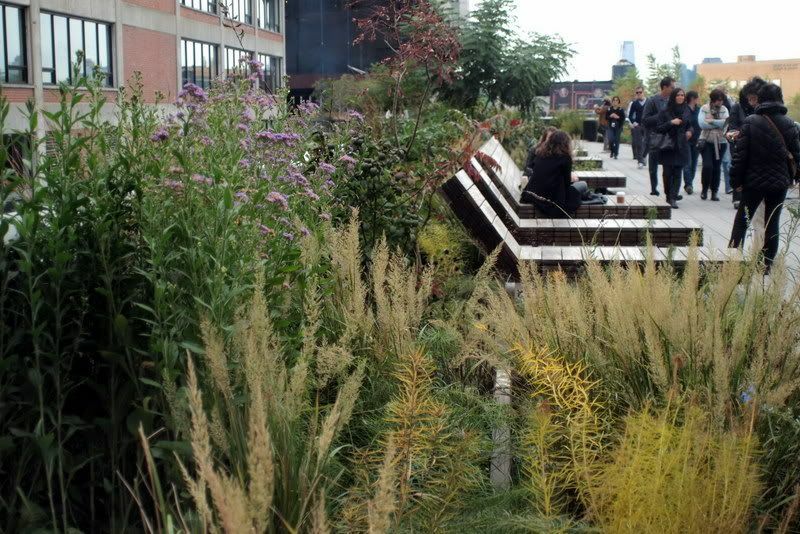 What an intriguing take on the High Line. You make me see it in ways I hadn’t known before, refracted through Jane Jacobs and The Great Gatsby, and time. The MB Maher photos are stunning. Thanks for taking me back to the high point of my summer vacation. The photos from both of you are fantastic and just reinforce my desire to see this remarkable place again. 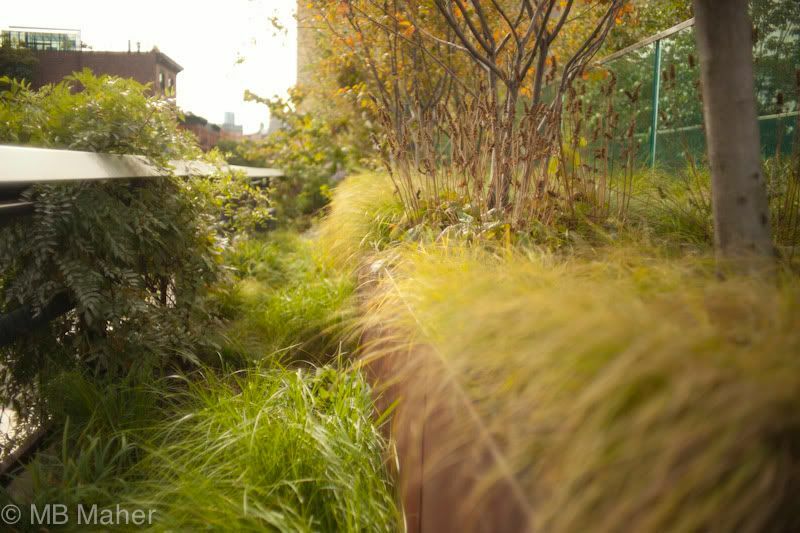 If you are interested, James at View from Federal Twist just posted his pictures and thoughts about the High Line as well. It looks like he was there around the same time you were. 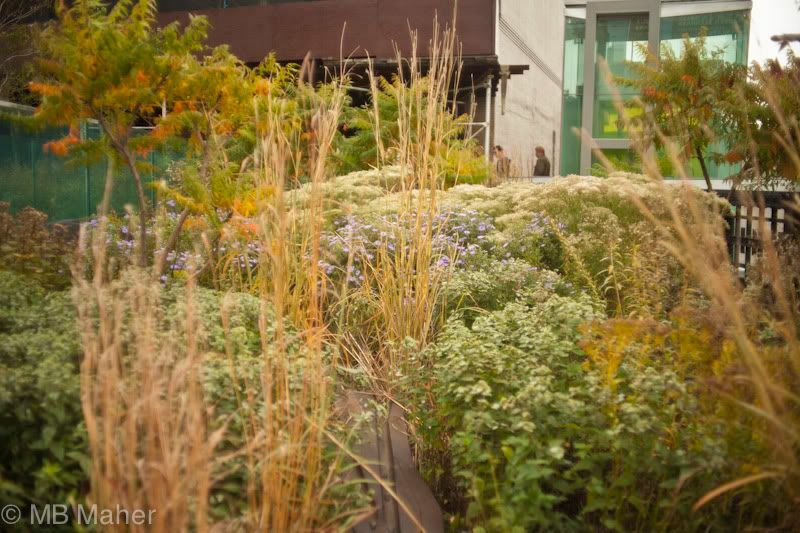 Maybe we should have held up signs that said “blogger.” It seems so many visited the Highline this October. It’s wonderful to read so many viewpoints of it in words and photos. NYC, Mitch le magnifique and you, you made my day ! !